It's been a busy past week! I had a great opportunity not only for some dental learning, but also to catch up with some old friends at the FGDP's Foundation Dentist Open Day at the Royal College of Surgeons. The various talks throughout the day covered the popular topics that come up again and again in Dentistry nowadays and gave us an insight into where a career in Dentistry may be heading for us in the next 30 or 40 years. Whilst nothing will beat being there on the day, here I shall summarise some of the main points from the talks that were held throughout the day. What kind of Dentist would you like to be? A very important question - but most young dentists I ask find it difficult to come up with an answer. Lawrence Mudford spoke about how important is not to get complacent during your career and fall into the trap of just coasting along. Patients are changing - gone are the days of full clearances as wedding gifts. People are retaining their natural teeth for longer, so gradually older patients are requiring more care - especially in terms of periodontal disease and also more recently, peri-implantitis. As a profession we have to adjust to this change in patient needs. Complete denture construction may soon be a specialist treatment and there must be provisions to allow for domiciliary care for the elderly. As long as we are ready to adapt and continue our life-long learning we can not only survive, but thrive in this new era of dentistry. So what's the difference between aesthetic and cosmetic dentistry? So there is a general view that aesthetics are concerned with beauty but implies restoring teeth to their natural appearance, whereas cosmetic is improving their colour, shape or arrangement to look better in the eyes of a patient. However, according to Mike Mulachy and the Royal College of Surgeons, there is no difference between aesthetic and cosmetic. There has been an increase in interest in aesthetic dentistry recently and especially in the provision of Botox and dermal fillers in light of the Keough Report which investigated the PIP breast implant scandal. Currently, injectable fillers can be provided not only by Doctors, Dentists and Nurses, but also by Beauty Therapists as long as they have appropriate training. Botox and Fillers are Prescription Only Medicines (POM), although there can be lots of different types of filler and some may be unregulated. Beauty therapists however are not trained to deal with anaphylaxis and cannot stock Epipens in their salons as they are also POMs. This could lead to some issues in the future. There is also the issue as to whether these treatments should be available under the NHS. There has been outrage recently with news breaking of some women who have had breast implants on the NHS - this is clearly a sensitive issue with some people, especially with the austerity measures going on with government at the moment. Harry Singh is holding a webinar in the next few weeks speaking about Botox in Dentistry - keep an eye out for a blog post summarising the talk. A big source of fear for some young dentists, especially FDs new to practice life. Richard Moore spoke of how many inappropriate referrals he receives as an oral surgeon and helped us to understand what kind of cases we should be able to manage ourselves. 80% of patients who require oral surgery of some form or the other can receive their treatment in primary care. There are specialists out in practice with NHS contracts to provide treatment, so it isn't always necessary to refer patients to a hospital setting. So what sort of things should I be referring to an oral surgeon? That can depend on your experience! Some common reasons to refer include symptomatic wisdom teeth, cysts, complicated medical histories, anxious patients and bariatric patients. Other reasons for referrals can happen as a result of complications during surgery in primary care, such as failed extractions, OAC/OAF, tuberosity fracture, displacement of fragments into the antrum. To see more about oral surgery see one of my previous posts here. There is a shift in the way we manage disease in dentistry: from the Drill and Fill era, to the Minimally Invasive approach. I spoke about a talk about MI dentistry led by Professor Banerjee here - but MI dentistry isn't exclusively driven by caries management. With the popularity and uses of adhesive dentistry, namely composite (see a previous post about composites here) exploding in the past few years, the provision of destructive aesthetic solutions such as porcelain veneers or crowns is becoming frowned upon by some dentists like Nicholas Lewis who spoke to us about restorative dentistry. Materials such as Mineral Trioxide Aggregate (MTA) and Biodentine have the potential to revolutionise pulp therapy, and the introduction of high fluoride products and compounds such as ACP are now routinely prescribed to help prevent and manage disease. So whilst the implant industrious is booming, there is still no replacement for a healthy natural tooth. It has been shown that 15-20% of implants will suffer from peri-implantitis within 10 years. I saved the best til last - and if you are a regular reader of my blog, you will know I have recently written the memorably named 'How to Avoid being Sued before you hit 30'. The main message that I've taken from both of these talks by Dental Protection representatives (here it was Jane Merivale) is that complaints can arise from simple misunderstandings and poor communication therefore it is imperative that dentists learn not only how to handle a complaint, but to minimise their risk of complaints by working on their communication skills and identifying 'red flag' encounters early! See my summary of Jane's talk here. 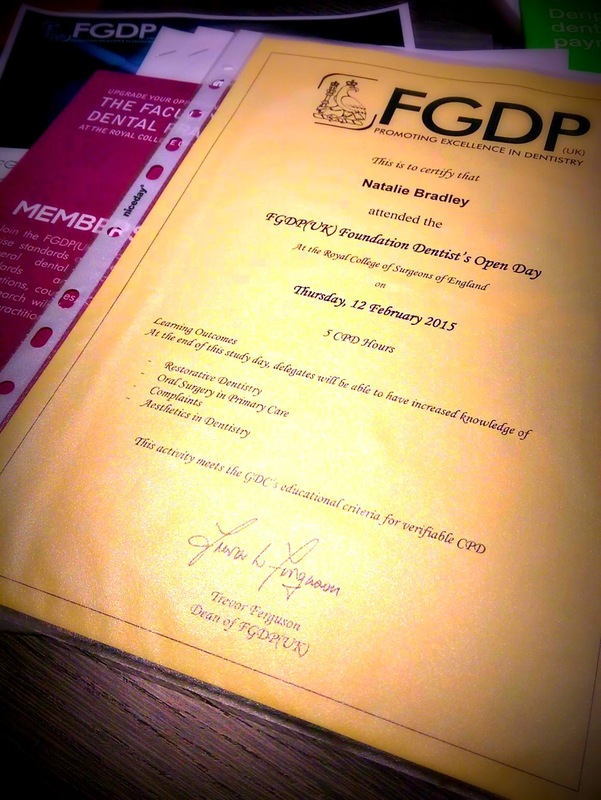 FGDP also hold lots of postgraduate courses to help you make the most out of your career in dentistry. I think it's really important to look into some form of postgraduate qualification, not only due to the today's competitive job market, but dentistry is developing and changing so much even in the few years since I first went to Dental School so it's really important to keep up-to-date with what's going on! 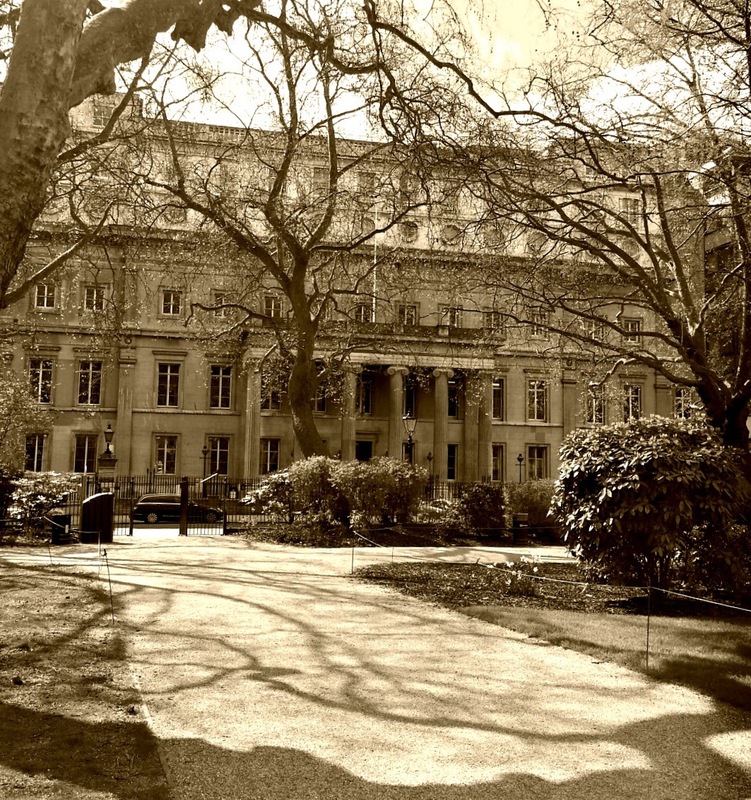 Thanks to FGDP, the Royal College of Surgeons and to all the speakers for such an informative day! To have a look at what courses FGDP provide, take a look at their website. Did you attend the open day? Which talk did you like the best? Please leave your comments below!